Following the funeral service, Anthony’s casket was taken to Good Shepherd Cemetery in Lancaster for a private burial. 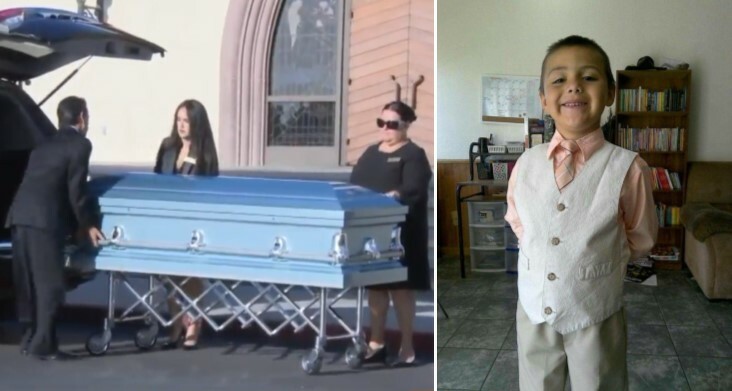 QUARTZ HILL – Hundreds of friends, relatives and classmates — many donning superhero shirts or capes — gathered Friday for a solemn funeral to remember Anthony Avalos, the 10-year-old Lancaster boy who was allegedly tortured to death by his mother and her boyfriend. Barron said Anthony’s classmates said he would stand up for kids being bullied, and he also tried to shield his siblings from abuse at home. Anthony’s father, Victor, thanked the community for its support of the family. The funeral service was a heartbreaking experience for some of Anthony’s classmates. “He was my first-grade friend and now he’s dead,” Jonathan Peitz told NBC4 outside the church. Anthony was found unresponsive in his mother’s home June 20. He died the next day. The alleged abuse included whipping the boy with a belt and a looped cord, pouring hot sauce on his face and mouth, holding him by his feet and dropping him on his head repeatedly, according to the court papers filed earlier this month. Anthony’s mother, Heather Barron, 28, and her boyfriend, Kareem Leiva, 32, have been charged with murder and torture in the boy’s death. An attorney for Anthony’s family, including his father, aunt and uncle, is also demanding answers from the county Department of Children and Family Services, alleging the agency had multiple contacts with the family in recent years and indications of abuse but failed to take steps to protect the boy. DCFS officials say they are conducting a thorough review of the case. 6 comments for "Hundreds honor life of 10-year-old boy allegedly tortured by mom, boyfriend"
The mother is a monster along with her stupid boyfriend. She wanted to please her man they killed her kid and at the end she has NOTHING. RIP at Good Shepherd Cemetery little guy. Hope they didn’t go to Halley Olsen Mortuary, I haven’t heard good things about that place from friends, but dont know for sure. What the heck is wrong with these woman that go for those scumbag losers?? You must also believe you are SCUM or you’d protect your kids and kick out the scumbag!!! Shameful. Lord take him in your arms.